Actual patients and illnesses are combined in a collection of stories that illuminate the struggles of a young doctor faced with life and death situations. He treads the fine line between detachment and compassion while enduring exhaustion and bewilderment from patients who may be lying and who are certainly dying. As a resident, he knows he needs help but asking for it can be a sign of weakness. A hospital is full of bureaucracy and egos and people working at cross purposes to move patients through while they receive care. You don’t need a doctor to be your best friend, you need him to be qualified and capable. People skills and healing skills sometimes intersect but not always and a traumatic moment for a family is just one moment in a doctor’s crowded day. Holt’s stories show us moments of grief and grace. In this artful, unfailingly human, and understandable (Boston Globe) account inspired by his own experiences becoming a doctor, Terrence Holt puts readers on the front lines of the harrowing crucible of a medical residency. A medical classic in the making, hailed by critics as capturing the feelings of a young doctor's three-year hospital residency . . . better than anything else I have ever read (Susan Okie, Washington Post), Holt brings a writer's touch and a doctor's eye to nine unforgettable stories where the intricacies of modern medicine confront the mysteries of the human spirit. 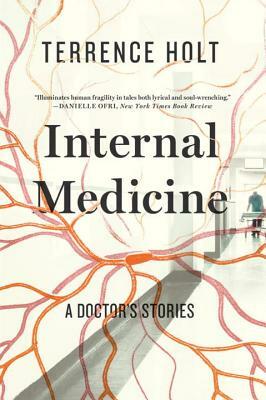 Internal Medicine captures the stark moments of success and failure, pride and shame, courage and cowardice, self-reflection and obtuse blindness that mark the years of clinical training (Jerome Groopman, New York Review of Books), portraying not only a doctor's struggle with sickness and suffering but also the fears and frailties each of us doctor and patient bring to the bedside.